Did you think you had heard the last of me? Never! I was explaining to someone else how to use it. “Here’s how you do it,” I said. “You just type in the surname, let’s say Gorton.” I was thinking of W.B. Gorton, Nana’s grandfather. I was hoping to find his obituary in an old newspaper. I clicked the third “Gorton” link down and the following news clip came up. “Death’s demands. 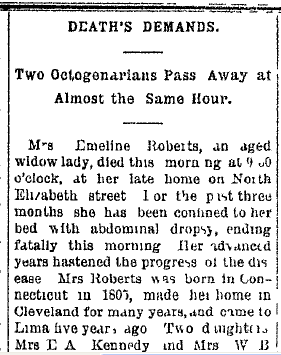 Two Octagenarians pass away at almost the same hour." The next words said “Mrs. Emaline Roberts…” What luck! That was Nana’s great grandmother! Apparently two women in their 80’s died within an hour of each other in Lima, Ohio, which is odd and discovering that one of them was Nana’s great grandmother was also odd. But finding her, so unexpectedly, was not the strangest part. It helps to have the context of this story. You, of course, remember, that Lima, Ohio, is where your grandmother, Frances Lenore Myers, was born. 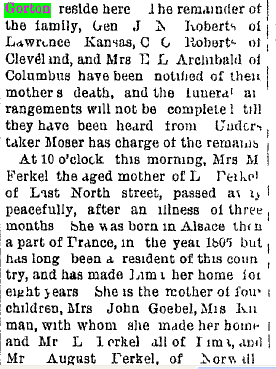 I was completely surprised to see Nana’s great grandmother Emaline dying in Lima, Ohio, because, according to my research, Emaline had lived her later years in Cleveland, Ohio. She was born in Connecticut in 1805 and married John Roberts, also from Connecticut, in Gustavus, Trumbull County, Ohio in 1822. They lived in Warren and Mecca, Trumbull County, before they moved to Cleveland in 1870, living there until 1890. John was a machinist and worked at a steam saw mill to support his family of 6 children. What was she doing in Lima, Ohio in 1890? In calculating her age, I realized, she was 80 years old when she came to Lima, so she had probably left Cleveland because of advancing age (her husband, John Roberts, had died long before her, in about 1871) and came to be cared for by her daughters, Frances Lucinda Gorton, who was 64 at the time, and Ella A. Kennedy, who was 43. Let me paint a brief picture of this large family. It was 1890. Nana is just 3 years old, with three older brothers, ages 18, 14 and 9 (younger brother Ralph isn’t born until 1892), living with their mother Mary Augusta Gorton and father, George W. Myers. Mary’s father, “W. B.,” (William Benjamin) Gorton, (Nana’s grandfather) had just died five years ago “of heart problems,” at age 60, after having founded Christ Church in Lima and having created a best-selling flour at his mill called "Lilly White Flour." The matriarch, Emaline, (maiden name, Hotchkiss) Roberts, Mary's grandmother, is coming home to her family of two daughters, both widows, their children and grandchildren. Emaline's younger daughter, Ella A. Kennedy, has a 15 year old son, Harry. Emaline’s oldest daughter, Frances Lucinda Gorton, has two adult married daughters. The married daughters’ husbands, George Myers and Eugene MacKenzie had taken over the Gorton family business, Ottawa Mills (flour), a few years before W.B. Gorton, (Frances’ husband) died in 1885, George quitting his job as a railway express agent and Eugene quitting his job as a town clerk. It is to this extended family that Emaline is returning. Seeing things from the genealogical sky, I know that this mill burns down two short years from then and George goes back to working as a railway express agent and Eugene goes into the coal business. Harry dies in 5 years, age 20, (of what I haven’t discovered yet), his mother remarries and moves to California. Nana’s brother Albert dies in 1905, and brother Ralph in 1910, and their mother, Mary A. in 1917, all of TB, and George follows shortly afterwards in 1920 of "gall bladder rupture," age 74. Frances Lucinda Gorton lives to 86, dying in 1912 and her daughter, Ella Mackenzie, lives to be 85, and dies 4 months before I was born, in 1946. Frances Lenore Myers, of course, marries AJ Gates and rises out of Lima and moves to Hartwell, Ohio to begin her family with baby Constance in 1912. The significance is that this chance news story caused me to look at a family, going through all the strife and problems of life, much like what we are going through, and not knowing how it is all going to turn out. That is one of the great rewards of genealogy- you get to see things from a much larger perspective than just one lifetime. It allows you to think about why you are here and causes you to value the moment you are given. I realized that date was... tomorrow! and now as you read this, it is today! She died 118 year ago today! What are the chances that you would discover a death date exactly 118 years later, on that date? I say "on the date" because she probably knew I needed a day to write this. So give a thought to Nana's great grandmother, your great, great, great grandmother- without her we all wouldn't be here. Hope you are all well. If you have a response you can post it here.